Andrew N. Pierson was born Anders Nil Persson in Skane Lan, Sweden, in 1850. After arriving in the United States, Pierson established A.N. 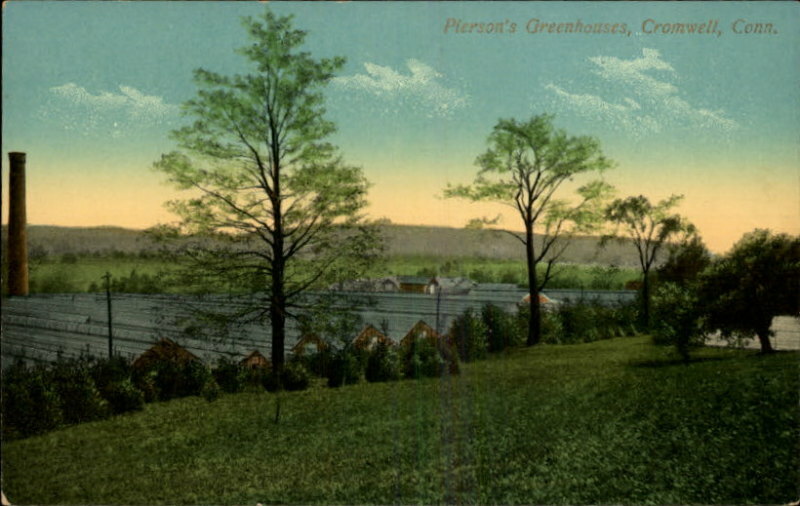 Pierson’s, Inc., a small floral nursery in Cromwell that evolved into the largest commercial rose growing enterprise in the country. Pierson brought more than just economic prosperity to Cromwell, however. The company’s labor and production requirements changed the town in ways still visible today. One of the most significant contributions Pierson’s enterprise made to Cromwell was to the local architecture. The Main Street Historic District in Cromwell contains several houses Pierson built for use in his floral operations. The work of local merchants, farmers, industrialists, and civic leaders transformed the 18th-century industrial settlement into, what is today, a fashionable and successful 20th-century residential community. The labor force Pierson’s enterprise attracted to Cromwell also played a significant role in shaping the town. The largely immigrant workforce not only brought shifts to the demographic balance that are still visible today but also made their own contributions to the architectural landscape. In 1893, Pierson took over several tenant houses built by John Stevens in 1875 for his J. & E. Stevens Company. These houses on Prospect Place served Pierson’s workers for several decades. Between 1922 and 1925, a series of Colonial Revival-style cottages became known as the “Holy City.” This name alludes to Pierson’s Russellite faith, which believed the end of the world was near and required houses for the faithful to use for their return to heaven. “Middletown Upper Houses Historic District – Nomination Form.” National Register of Historic Places, 1979. Link. Winquist, Alan H., Jessica Rousselow-Winquist, and Swedish Council of America. Touring Swedish America: Where to Go and What to See. St. Paul, MN: Minnesota Historical Society Press, 2006.